Original design Personalised Stacking ring set designed to be worn together, the middle band is handstamped and there is 4 side bands. The lettering is gold lettering. This is a slim band that can be made with the names and dates of your choice either on the inside or outside of the ring. This is a beautiful eternity ring with black diamonds. The diamonds are set into half the 14ct white gold band. Resize Your Ring for FREE! This beautiful script ring is made out of 0.925 Sterling Silver and available in a wide array of ring sizes. Take pride in having a beautiful name with the Sterling Silver Custom Love Ring. Resize Your Ring for FREE! 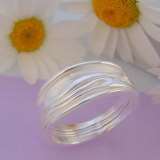 Inspired by Lauren Conrad from The Hills, this trendy two finger name ring is handcrafted in Sterling Silver (0.925). Personalise this ring with your own name and make it a piece of Jewellery as unique as yourself! This ring is also available in 14ct Gold. Resize Your Ring for FREE! Personalise this Silver Arabic Ring with any saying or personal message in Arabic. Choose up to 5 words (21 characters) to inscribe in Arabic on this piece of unique Arabic jewellery. Resize Your Ring for FREE! Get this Silver ring with the letter of your choice! This single letter ring is an excellent option for those who want to keep their name mysterious!